Minstead has a long tradition of Mumming. This photo above was taken in Minstead in 1912. The photo below shows the current group of Mummers in the Trusty in 2008. In the old photo one of the characters is an Abbott. The Abbot family are still in the village and provided the script (hidden in their attic) that we still use today. Be sure to see us this year. We resurected the Minstead Mummers almost 40 years ag and have performed it every year on the village green since then. We come as a climax to the carol singing and the visit of Father Christmas. We always need more performers so if you would like to have a go, ring Nick Mellersh at Minstead. Mummers plays are traditional Christmas plays that have been taken around the pubs a big houses for many many years. The text with its talk of “Turkish Knights” and St George might well go back to medieval times. Many people think so. They believe the plot of killing and resurrection is an example of the “old year” being killed at the winter solstice and the “new year” rising again. Others see the tradition only going back to the 19th century. 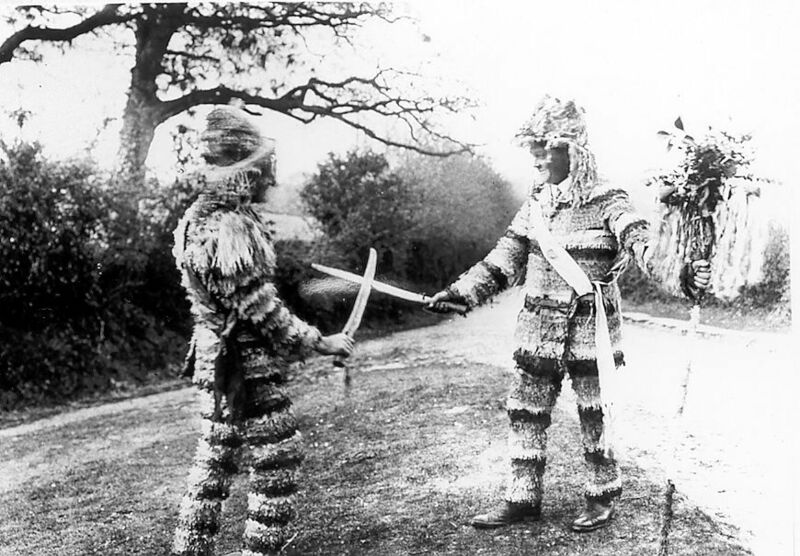 What we know for sure is that Mummer’s plays were performed in almost every village in the South of England one hundred years ago. Minstead’s troupe of mummers was photographed in 1912, see the photo above. The great grandson (or possibly the great great grandson) of St George in the picture lives and works in the village today. Mummer’s plays traditionally end with an appeal for money and one hundred years ago this could be very profitable. You could, so they say, earn as much in one night’s mumming as in a month of farm work. We keep up the tradition of begging for money but nowadays collect for some good cause. 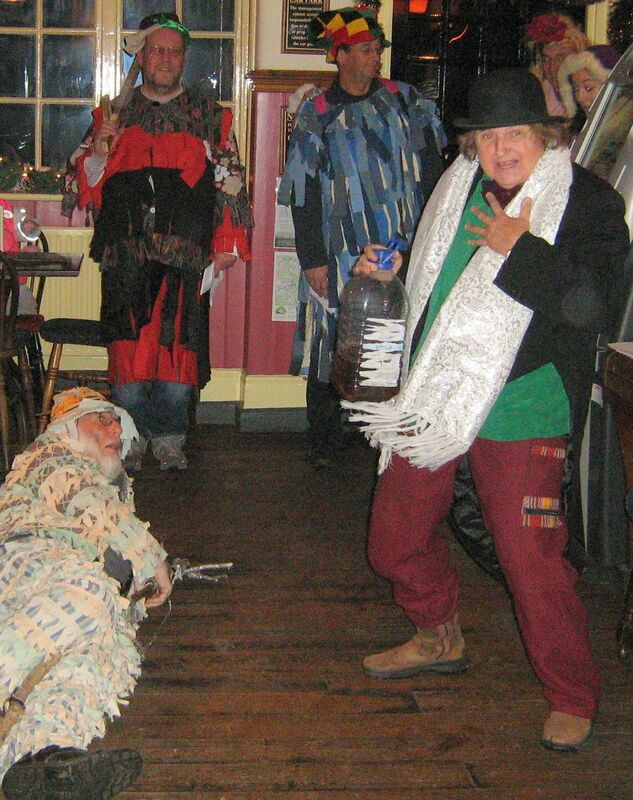 What is special about Minstead Mummers? In simple terms - we are the best. The troupe acts with verve and humour and we have added a few modern touches. Each year there is a new topical joke and to suit the 21st century we have a female doctor and a female blonde (or brunette) bombshell to light up the proceedings. Unlike many troupes our performers have all lived or are still living in Minstead and we perform a Minstead script handed down from the people you see in the 1912 photograph. We are the real thing. We will be out and about on Saturday 17 December on Minstead village green and in the pubs in Minstead, Cadnam, Brooke, and Fritham. Don’t miss us. Below is the film of our 2014 performance.